In 1994 Ray joined the Scottish band STILTSKIN as their front-man. Their debut single “Inside” was an immediate success, reaching number one in several European countries, and to this day “Inside” remains one of the most recognisable rock songs ever recorded, being used of course by “ Levi’s “ as the soundtrack to one of their legendary jeans commercials. Due to the amazing success of STILTSKIN, Ray was brought to the attention of one of rock’s biggest ever bands, GENESIS, and was given the job of lead vocalist after the resignation of Phil Collins in 1996. 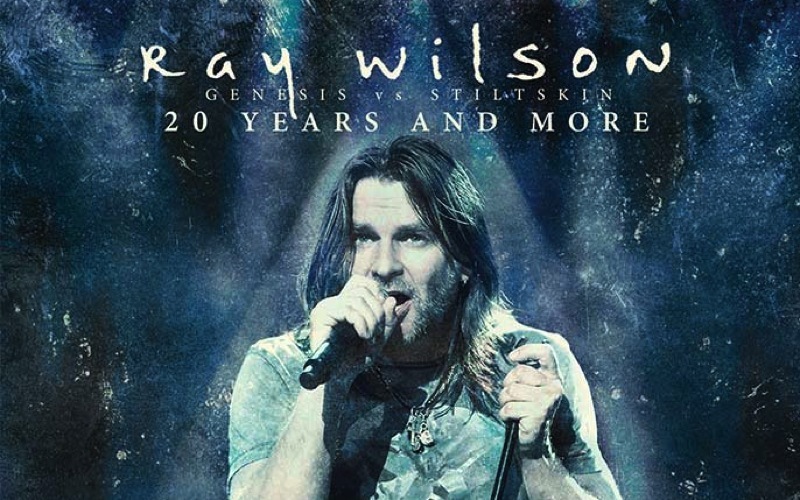 From 1996 to 1999 Ray was singer/songwriter with the rock giants, and in the process, they recorded the fourth best-selling album in the band’s history – “CALLING ALL STATIONS”, following this up with a European Tour, and headlining the world famous Rock am Ring/Park festivals in 1998 . In March 2010 GENESIS were inducted into the “Rock’n‘Roll Hall of Fame” being recognised as one of rock’n’roll’s most important and influential bands. In 2009, Ray’s GENESIS CLASSIC project brought together 10 musicians from across Europe, with the members of his band STILSKIN being joined on stage by the Berlin Symphony Ensemble. GENESIS CLASSIC celebrates the music of GENESIS, and its members, taking classical interpretations of world famous songs, and airing them in a form never heard before. A Triple live CD/DVD of the GENESIS CLASSIC show, recorded at the Poznan Philharmonic Hall, was released in 2011, featuring songs from all across the GENESIS spectrum, and of course songs from Ray’s solo career. Captured live on stage at the Polish Radio Music Hall, at the iconic Radio Troika Studios in Warsaw, Poland on April 14th , 2013, the DVD features various milestones from Ray’s career, including the songs, “Inside”, the European wide No 1 smash hit from 1994, “Another Day”, remixed by world ranked number 1 DJ, Armin Van Buuren, the song going on to become No 1 in the European dance charts, and “CONGO”, from the last ever GENESIS studio album, CALLING ALL STATIONS, the album going on to reach No 2 in both the UK and German Charts. This release highlighted the huge part that classical musicians now play in his band , with Ray giving special mention to the early GENESIS song, “RIPPLES ”, a regular fixture in Ray’s live set, and a firm audience favourite, Ray describes the Instrumental section of this song, as “ simply magical, an overwhelming piece of music”. Ray performs several of his favourite GENESIS songs, touching on his time spent touring with the band. Songs like “MAMA”, “NO SON OF MINE” and of course the classic “CARPET CRAWLERS”, a song which Ray recently re-recorded with GENESIS guitarist, STEVE HACKETT, clearly demonstrating why GENESIS chose Ray to replace Phil Collins, as the bands frontman in 1996. Ray tours extensively with highlights including a main support slot with Rock legend STING, at the Life Festival in Osweciem, Poland, and headlining the Wroclaw New Year’s Eve celebrations, playing to over 150,000 fans. 2016 sees Ray releasing two new studio albums, “Song For A Friend” and later this year “Makes Me Think of Home”.